Following the sudden death on of Vice-president Dr Omar Ali Juma (see Obituaries) president Mkapa appointed on July 12 Dr Ali Mohamed Shein (53) to take his place. According to the Guardian, President Mkapa’s nomination came as a surprise to most Tanzanians including journalists who had predicted that former OAU Secretary General, Dr Salim Ahmed Salim, and Deputy Minister for Foreign Affairs and former High Commissioner irl London Dr Abdulkadir Shareef would be the front runners. The Guardian article went on: ‘However, all those who had made predictions were correct on two things. First, that no woman politician stood a chance of taking the vice-presidency and second, whoever was to be appointed would come from Pemba. 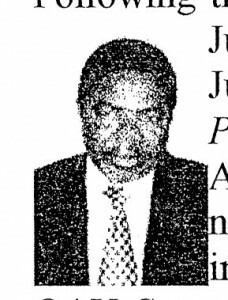 Though Dr Shein is relatively unknown in Tanzanian politics, he has a long curriculum vitae with a strong academic background. He was born in Chokocho village, Pemba, in 1948 and attended Lumumba College in Zanzibar before proceeding to Voronezh State University in the Soviet Union where he obtained his A Level Certificate in 1970. He got his first degree at the Odessa State University in the Soviet Union in 1975 and later his Msc Degree in Medical Biochemistry and his Ph.D in Clinical Biochemistry and Metabolic Medicine from Newcastle University in Britain. His political career goes back to 1968 when he was the Publicity Secretary of the Afro-Shirazi Youth wing at Lumumba College and General Secretary of the youth wing for all secondary schools in Zanzibar. Before his appointment as Minister in the Zanzibar President’s office, he was Minister for Health in the government lcd by Dr Salmin Amour. Reacting to the nomination of Dr Shein, many MP’s from the ruling Chama Cha Mapinduzi (CCM) hailed President Mkapa for injecting young blood into the government But opposition MPs expressed fears that because Or Shein is young he might find it difficult to ‘manage the old guards’ in the CCM government. The National Chainnan of the opposition Civic United Front (CUF) Prof Ibrahim Lipumba said that Dr Shein was an unknown personality in politics. “I have heard of him for the fIrst time today,” he said. Prof Lipumba claimed that Dr Shein was not accepted even by Pemba residents. He was the representative of Mkanyageni in Pemba, a constituency whose general election results last year were controversial. But the leadership ofthe opposition CHADEMA party praised President Mkapa for his wise choice. According to the UN’s Human Development Report 2001 Tanzania has climbed from l56th position in terms of people’s life expectancy, income per person, educational enrolment and adult literacy to 140th out of 165 countries. Norway is the first. The Head of the Development Unit at UNDP Tanzania, Ernest Salla, said that, with poverty reduction at the heart of the government’s programme and the formation of the Poverty Reduction Strategy Paper (PRSP) and establishment of a national poverty monitoring system, the future for Tanzania was bright. According to the Technological Achievement Index (TAI), contained for the first time in the Human Development Report, Tanzania is also among nine countries classified as ‘marginalised’ in terms of technological innovation and achievement. They have been listed as the lowest in rank out of a total of 72 countries in the world in terms of creating and using technology. The HDR stresses that in this network age: “Any country that fails to make effective use of technology is likely to find itself falling behind in human development and marginalised in the global economy. The Poverty Reduction Strategy Group has praised Tanzania’s 5.8% growth rate and described it as among the fastest growing economies not only in East Africa but in the whole of Africa. Uganda’s rate is 5% and Kenya’s 0.3%. Tanzania has been placed at the top of Sub-Saharan African countries in attracting direct foreign investment for eight years, according to the report. Net foreign direct investment as a percentage of GDP increased from 0.3 per cent in 1992 to 2.1 per cent in 1998, compared with an average increase of 0.1 per cent for sub-Saharan Africa. Tanzania was described as one of the most improved countries in the region. Outgoing UNDP Representative in Dar es Salaam, Sally Fegan­Wyles, told the Daily News on July 19 that Tanzania had become a ‘standard bearer for excellence’ in economic recovery, poverty reduction and the war against corruption after years of tough economic and political reforms. It was ‘the gold standard’. This is how David Tarimo described, in the Guardian, Finance Minister Basil Mramba’s first budget since taking up his post. The writer referred to what he described as the clearly articulated vision that poverty reduction could only be realised by significant growth and that this growth was dependent on nurturing competitive industrial and agricultural sectors The boldness and ambition was seen in the increased revenue collection target of 12.1% of GDP compared with 11.7% for 2001 together with the significant reductions in import duties and certain other taxes. Changes made to ensure that agriculture would be competitive included the abolition of stamp duty on proceeds from sales of agricultural produce and the reduction of land rent on agricultural land by 66%. The five per cent cap on local tax (producer and livestock cess) announced two years ago was to be enforced. Changes to promote the local dairy sector included the banning of imported powdered milk and the imposition of suspended duty of 25% on other types of imported milk -except for infant milk. The VAT on milk packaging materials had also been abolished. A major step towards reducing industry’s production costs was the abolition of customs duty on capital goods and raw materials. Business was also said to have welcomed the abolition of the two per cent withholding tax on payments for goods and services; investors would welcome the abolition of withholding tax on interest on foreign loans. In raising revenue the Minister introduced a gaming tax and planned to raise significant revenue through abolishing the exemption from VAT that the government and its institutions previously enjoyed. In the media the headlines concentrated on the Shs 30,000 million allocation for an increase in salaries of civil servants. OTHER HGHLIGHTS included an increase in airport charges; a fuel levy on petrol; increases in duty on beer, cigarettes and soft drinks; a halving of excise duty on locally-produced wine; new taxes on lotteries and casinos; VAT on computers, printers and accessories to be abolished; hospital equipment and taxes for drugs used to treat TB HIV / Aids and malaria abolished; VAT on education investment and ground transport for tourists abolished; Shs 8 billion provided for next year’s census. The Minster said that expenditure would total Shs 1,764 billion and revenue Shs 991 billion leaving a gap of Shs 773 billion to be filled by external assistance and debt relief, the drawing down of reserves, the sale of shares in previously privatised public firms and by increases in taxation. But Chairman of the Parliamentary Finance Committee, Dr Juma Ngassongwa, a CCM MP, said that the fact that the economy was showing signs of recovery remained a mystery to the majority of Tanzanians who continued to suffer in poverty. He said that with a birth rate standing at 2.8 per cent the 4.2 per cent economic growth figure was brought down to a mere 1.4 per cent. Although agriculture was still the mainstay of the economy, government seriousness in insuring growth in the sector was not reflected in the development programme 2001 -2 nor in the national budget. Only 5.5 per cent of the budget had been allocated to the agricultural sector. As ‘The Express’ put it ‘The agricultural sector, whose dismal performance (3.4% growth rate) last year largely contributed to the failure of the economy to reach the targeted growth rate of 5.1%, is still besieged by the same (seemingly intractable) problems which cannot be solved in a very short span of twelve months. These problems include: lack of investment in agriculture -the sector accounts for 50% of GDP but of all the projects sanctioned by the Tanzania Investment Centre, only 5% concerned agriculture; primitive farm-implements, such as the traditional hand-hoe which perpetually condemns the peasant farmers to subsistence farming; flawed marketing policies accompanied by mismanagement and corruption in the cooperative unions, and imperfections inherent in the marketing boards which inhibit efforts to increase production; low processing capacity of agro-based industries; and, lack of linkage between agriculture and industry. It does not appeal to an inquiring mind that, with a budgetary allocation of only 5.5% per cent to agriculture (compared with, for instance, 18% to Defence and Security, and 21% to administration), the government is really seriously committed to ‘revolutionizing’ agriculture, no matter how impressive the said ‘strategy’ may be on paper. Tanzania has won in the three-year-long long dispute over the cost of the $150 million 100 MW Malaysian-financed Independent Power Tanzania Limited (IPTL) thermal plant project at Tegeta in Dar es Salaam. Production of electricity should finally start in October, the Minister for Energy and Minerals, Mr Edgar Maokola-Majogo has announced. The London-based International Centre for Settlement of Investment Disputes (ICSID) ruling issued on July 12 stated that the value of the plant would be reduced to $125 million, not $150 million as claimed and the cost of electricity would be $2.8m per month as proposed by TANESCO as against IPTL’s $4.2m demand. Maokola-Majogo also announced that the construction of the long-delayed 232-kilometre $300 million gas pipeline from Songo Songo to Dar es Salaam, would start in September and would be completed in 2003. He said the implementation of the gas project would go hand in hand with providing towns and villages along the gas pipe with power from gas and solar power at a cost of $13.3 million. The gas from Songo Songo would be used to generate power at TANESCO’s Ubungo gas turbines in Dar es Salaam and later at the IPTL plant. A crisis in the sugar industry erupted in May this year when local producers threatened to suspend production, blaming the government for issuing 22 licenses to import 100,000 tonnes of ‘industrial’ sugar and thus spoil their market. The Guardian reported that the crisis deepened in June when a consignment of more than 6,500 tonnes of sugar was confiscated by the Tanzania Revenue Authority (TRA) after it was found to have been imported illegally. Early reports had it that the ‘game’ was being practised by some prominent businessmen, who used the name of the Tanzania People’s Defence Forces (TPDF) to avert paying import tax. On reaching the local market, the alleged businessmen sold the sugar at throwaway prices, thus, undercutting the price of locally produced sugar. In April, Minster for Industries, Iddi Simba, had been reported in The East African as having revoked 10 import licenses for 38,000 tonnes saying that the permits had been issued without his authority. Tanzania’s annual sugar requirement was said to be 290,000 tonnes and local sugar production about 180,000 tonnes so that importation, legally or clandestinely was necessary. Local sugar was highly taxed but imports could sell at much lower prices thus giving higher profit margins. Local producers argued that some of the permit holders imported refined sugar but declared it as raw sugar to cheat on taxes. The dynamic Minister Simba was in further trouble when it was reported on August 8 that the Parliamentary Select Committee on Finance and Planning had criticised Mr Simba’s handling of the privatisation (perhaps better expressed as ‘liberalisation’) of the Shipping Corporation (NASACO). He was said to have ignored a Cabinet Paper by issuing some 30 licenses for clearing and forwarding operations to foreign shipping companies. The Minister was quoted as saying that the question of corruption did not arise. “I am not in politics to make money” he said. “In fact I do not live on my ministerial salary”. Tanzania has become one of the first seven countries to show interest in a new political risk insurance agency for Africa -the African Trade Insurance Agency (ITA) which is being supported by COMESA and the World Bank. The agency said that there were significant gaps in the political risk insurance market when it comes to the assumption of risk in cross-border transactions. Premium rates were likely to range from 0.4% to a maximum of 2.5% depending on the length and type of credit involved. Risks eligible would include embargoes, expropriation, inability to convert or transfer currency, imposition of import or export taxes of a discriminatory nature, war and civil disobedience -Press Release. There has been some optimism in Zanzibar during recent weeks as the Secretaries General of both the ruling CCM (Philip Mang’ula) and opposition CUF (Seif Hamad) have conducted lengthy negotiations to try and resolve their many differences (TA No. 69). The negotiations were said to be taking place in secret in a Dar es Salaam Hotel. But, as this issue of TA went to press, no agreement had been signed and both parties were divided on how many concessions they could make in the interests of peace. According to The Express the secret negotiations revolved around a number of controversial issues raised by CUF in the wake of the October elections in which CCM emerged the winner and CUF refused to accept the results and accused CCM of fraud. The main issues were believed to be CUF’ s demand for fresh elections, an independent Electoral Commission and a Commission of Inquiry to probe the tragic killings of 26th and 27th January (TA No. 69). But, according to The Express, going by the oft-repeated pronouncements of some top leaders in both camps, neither party was going to soften its stance on the issue of elections. As far as CCM was concerned the 2000 elections were now history, and therefore the presidency of Aman Abeid Karume was a non-negotiable matter. On the other hand, CUF’s uncompromising position was that they could not go for anything short of a repeat of the whole election exercise throughout Zanzibar. They had adamantly refused to recognize Karume as President; the rest of the opposition parties had thrown their weight behind CUF. Some political commentators thought that, as in the case of the problems which erupted in the wake of the 1995 elections, this issue would be resolved by time. CUF National Chairman, Professor Ibrahim Lipumba, told his members in Zanzibar, and later, journalists in Dar es Salaam, that his party was dissatisfied with the pace of the CCM -CUF talks. He gave July 31 as a deadline for CUF’s continued participation, but, after a peaceful CUF rally in Pemba on July 22, this was later extended to the end of August. He said CUF had come to question CCM’s sincerity and suspected that the latter was taking part in the negotiations merely in order to impress the donor community. The Zanzibar President had earlier warned the donor community against ‘interfering’ in the internal affairs of Zanzibar and accused them of colluding with CUF to enforce a re-run of the elections. “But” according to Mtanzania “we’re not going to give in,” he said. When President Karume was in London in May some Zanzibari’s organised a demonstration against him. He was reported in Mtanzania as having said that he was too busy to meet them. Meanwhile, Amnesty International has called for support for Juma Duni Haji and another CUF leader in Zanzibar who have been charged with murdering a policeman in Pemba during the disturbances in January. The prosecution said that the trial should take place in Pemba. The Attorney-General was reported to have told the court that the accused had no case to answer but the police said that they had the evidence. The defence said that the prosecution was delaying matters so as to continue keeping the accused in jail. Swedish Ambassador Sten Ryland was quoted as saying that his country would give swift financial support to Zanzibar’s health and education sectors, as well as funds for rehabilitation of Zanzibar’s rich historical buildings, as soon as CCM and CUF struck a deal. As this issue of TA goes to press CUF leaders Lipumba and Hamad have been asking their members to be patient so as to give more time for the negotiations. Hard-liners were reported to be very dissatisfied by the lack of progress in the talks. Many had been highly critical of the delay in concluding the talks and with signs that the CUF leadership might be prepared to compromise. The CCM side was also said to be divided on how far to go to appease CUF. On July 19 the police said that they had seized anti-aircraft and demolition firearms on the island of Tumbatu. Tanzania officially became Africa’s third largest gold-producing country (after South Africa and Ghana) in July with the inauguration of its largest underground gold mine -the Bulyanhulu mine in Shinyanga run by the Kahama Mining Corporation Limited and Barrick Gold Corporation with a gold resource base of 14.6 million ounces. The Guardian described how an elated President Mkapa at the inaugural ceremony had indicated that in the rich and powerful stock exchanges of Toronto, New York, London, Paris and others they were learning to pronounce the Sukuma name, BULYANHULU, a village in a country they had never set foot in. As gold output from the mine built to full production, government royalty payments and taxes were expected to raise almost Tsh 12 billion ($13 million) for the economy in the first year alone, its contributions increasing as production at the mine rose. Addressing a huge audience at the mine site, which included delegates from around the world, the President attributed Tanzania’s quick leap to success to the country’s on-going economic reform measures. “The geological resources, however plentiful and attractive they may be, will remain unexploited, as indeed is the case in a number of countries, if the right enabling environment is not in place” he said. Tanzania had in the last five years received over one billion US dollars investment in exploration and mine development with the Bulyanhulu mine alone being worth US $ 280 million. Gold output was forecast to grow from 263,000 ounces in 2001 to 400,000 ounces a year by 2003. Mention was made of other benefits arising from the Bulyanhulu investment: Construction of a 68-kilometre road from the mine to the Kahama-Isaka road; construction of a 47­kilometre water pipeline from Lake Victoria to the mine, which is providing water outlets to communities along the way; an electricity transmission line from Kahama to the mine, which also providing power to the surrounding communities; and, the upgrading of Kahama Hospital. The Bulyanhulu mine will operate alongside Australian Resolute’s Golden Pride mine whose annual production is around 202,000 ounces, and the Geita gold mine -a joint venture between Ghana’s Ashanti Goldfields and South Africa’s Anglogold. Randall Oliphant, Barrick Gold’s President and CEO, said his company had chosen to invest in Tanzania owing to the country’s good governance, progressive economy, stable investment and legal climate. President Mkapa said “I know there is constant criticism that perhaps Tanzania has given away too much in creating a conducing environment for inward foreign investment especially in mining. But we remain fully committed to creating, maintaining and sustaining such an environment. Tanzania’s mining development stalled after the country adopted socialism soon after independence in 1961. Production declined to an all time low of 84 ounces in 1975 against a peak of 100,000 ounces in 1938 under British rule, due to poor planning and management. But a new mining act in 1998 opened the sector to foreign investment and that policy is now bearing fruit, with Tanzania attracting investors even when gold prices have fallen to around 18-month lows. The mining of the gemstone Tanzanite is creating problems. The East African (18th June) reported that following the granting of mining rights to the South African mining company AFGEM two foreign businessmen had been deported on grounds of alleged involvement in the smuggling of Tanzanite. There had also been several violent clashes at the gemstone pits at Mererani, near Arusha, during this year claiming the life of one man. Small scale miners have also gone to court to challenge the AFGEM monopoly and alleged harassment of indigenous miners. An Indian owned company that polishes Tanzanite gemstones, was said to be experiencing problems in obtaining sufficient stones since AFGEM, had been given its license. AFGEM is branding its stones making it difficult for Tanzanite smugglers to sell their unbranded gemstones. Another civil court case is underway. A former Tanzanian Director of AFGEM is suing the company for fraud. As this issue of TA went to press the High Court had demanded the immediate presence in court of one of AFGEM’s officials from South Africa. Fierce competition was underway in mid-August between Britain’s Thomas de la Rue and Germany’s Giesecke & Devrient for the contract to supply the next batch of 980 million Tanzanian bank notes of varying denominations. According to The East African (August 13) the Bank of Tanzania favoured the German printer although it had had to withdraw a previous lot of Shs 1,000 notes which they had misprinted. The paper said that the German company had also been rejected by the European Central Bank for misprinting billions of Euro notes. The East African’s ‘source’ was reported to have alleged that, although de la Rue’s bid was much lower than Giesecke’ s, there was a lot of lobbying going on in order to obtain a ‘donation’. The position was described as stalemate. Ongeri John writing in the Dar es Salaam Express has reported that Tanzania has been silently campaigning among poor countries asking them to turn down bids by the World Trade Organisation (WTO) to remove all trading restrictions by 2012. Tanzania, a WTO signatory, believed that making the world a free trade area would only help to enrich developed countries further and wreak havoc on weak economies. Industries and Commerce Minister Iddi Simba was quoted as saying that Tanzania had begun to miss WTO negotiation sessions after the realisation that it had nothing to gain from the talks. “Our position is that Tanzania has a poor industrial base without the technology to produce high quality but low priced products to compete with those from developed economies,” he said. 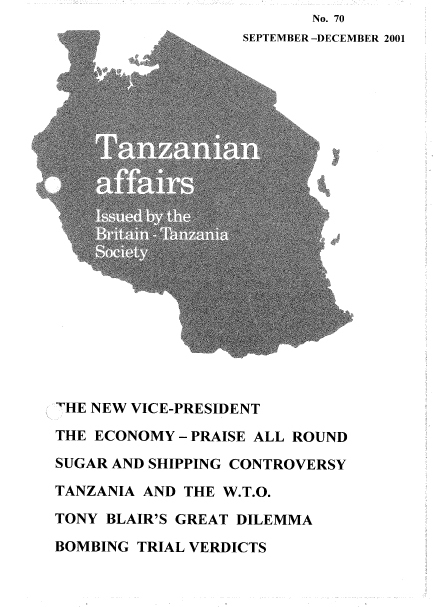 Simba added that this was Tanzania’s position even on its membership in the East African Community (EAC) which expected to become a free trade area in four year’s time. Minister Simba continued his campaign when, between July 22 and 24 trade ministers from 49 developing countries came together in Zanzibar and declared that they were prepared to take part in a forthcoming WTO conference at Doha, Qatar, but only on condition that the negotiating principles they had laid down in their ‘Zanzibar Declaration’ -long term duty free access for products from LDC’s, simplified rules of origin, understanding of their special structural difficulties, reversal of marginalisation of LDC’ s -were dealt with at the meeting. Minister Simba concluded by saying: “Most of us are not ready, psychologically, materially and technically for a new trade round. WTO Deputy Secretary General Ablassa Ouedraogo pointed out however that globalisation was inevitable. I was met at Kilimanjaro International Airport and was driven to Moshi by land rover. One unexpected stop was at a police station on the Moshi-Arusha road to collect a certificate of innocence. A few nights earlier, the driver had driven into the back of a tractor which had no lights, unfortunately not an unusual occurrence. We continued, with the promise that the certificate would be ready in a few days, until we got close to the town, then turned off down a road where the sides were crumbling away, turning it effectively into 1 1/2 lane road. A few more such areas and we turned onto a wide, tarmaced road which had obviously been recently repaired. The overseas supporters of a nearby college had wanted to improve the environment as well as the main buildings. The next day a couple of things about Moshi surprised me ­speed humps had to be approached carefully to protect the vehicle and obviously did their tasks well, and roundabouts around the town were well cared for, with large cartoon animal characters as decoration. It was much more acceptable than it sounds. New roads had appeared over the years as the town developed but these were still dirt roads and suffered from the recent rainy season. I later visited Dodoma, and was glad of another four-wheel drive vehicle as we took the road out of town to Msalato Bible School. At one point the ridges and ruts along the road were so deep that it was hard to move across. We met another vehicle coming towards us using the same rut and continued towards each other getting slower to see who would give way. Finally, the other vehicle acknowledged that it was our side of the road and drove up to its side of the ridge to safety. A later journey from Dodoma to Morogoro was a pleasure. Another Land Rover with an excellent driver, the journey was smooth and safe. Signposts gave regular distances as well as warnings of blackspots and instructions to ‘Drive Safely’. We turned off from Morogoro along the Iringa road to Mzumbe where I was attending the first provincial conference of the Anglican Church of Tanzania, the first gathering of all 1,300 clergy from both traditions of high and low church. The 12-day conference was a blessing and received the commendation of President Mkapa who opened the proceedings . During that period I journeyed to Berega Hospital for a weekend. A short way back towards Dodoma, then a turn off to the hospital. The dirt road was unsuitable for anything other than a four-wheel vehicle, or a bicycle, a common form of public transport for visitors and outpatients. For many years the hospital has been cut off during the year because of a fast running river. A new bridge gives them all year round access, but it is a much longer journey, so again I used the old route through the water. My final stay was in Dar es Salaam -traffic jams, traffic lights, speed -a real contrast to the rural areas. But here too was the variety of surfaces and the route between where I was staying and the Mtoni Centre included wide, dirt roads as well as good quality tarmac. A frequent problem, acknowledged by the Tanzanians, is that of maintenance -a road is used until it is unusable and then repaired. As with general life, Tanzanians make amiable drivers -a smile on their faces as they sometimes push things to the limit. They accept the difficulties with equanimity and pray hard to God for their safety. In March the prosecution case against former Minister of Public Works Nalaila Kiula and four others faltered in the High Court. Eight prosecution witnesses failed to substantiate the loss of 2.7bn/= alleged to have been occasioned by the accused persons between 1992 and 1995 through contracts for two roads. The first witness, Fariji William, Prevention of Corruption Bureau (PCS) Chief for Dodoma Region, was not able to elaborate on how he investigated the losses. When he was cross­examined by a team of five defence lawyers, he said that further information which was ‘very technical’ would be brought to the court by other prosecution witnesses who were experts in that particular area of investigation. In further evidence the wife of the former Minster was said to have been given an air ticket by Mitsubishi Motors Corporation in 1994 for a three-week trip to Japan. This was done a year after the company had sold 118 cars to the Ministry, the court was told. The sixth prosecution witness, Laurent Ndalichako, a Prevention of Corruption Bureau (PCB) official, told the Resident Magistrate’s Court that Kiula’s wife joined her husband’s official trip to Japan where he led the Tanzanian Delegation to a Communications Commission meeting. The witness said he had investigated the Minister’s salary particulars and allowances in the Ministry and other ministries where he had worked between 1971 and 1995 so as to compare the amount of money he had received with the value of property he possessed. Ndalichako also revealed that Kiula and his family had eight bank accounts including two current accounts, a loan account and savings accounts for his four children, with a total amount of Shs 33 million according to five bank statements issued on 30 January 1996. The 9th prosecution witness told the court on June 29 that the World Bank, which had provided finance for the integrated road project in Tanzania in 1991, had advised the Ministry of Works to exclude KV Construction Ltd from the list of bidders for pre­qualification to build the old Bagamoyo Road and New Bagamoyo Road. Former President Mwinyi had also questioned the credibility of the contractor. In spite of this, one year later, the road had been contracted to the company. The witness revealed that the contractor, apart from occasioning the government financial loss for not building the road, had not paid a Shs 385 million security bond to the National Insurance Corporation. At this stage the defence asked for a month’s adjournment of the case so as to have enough time to study this testimony and the documents tendered as exhibits -The Guardian.